Spiders. Not many people like them, although some people keep them as pets. However, even those who keep them as pets may not welcome the prospect of seeing “wild” spiders scurrying this way and that way while they’re trying to relax with a book or a good TV show. Is it time to call in the exterminators? Viewed one way, that won’t hurt. Exterminators can, at the very least, guard against other pests, although they are not always too effective with spiders. For example, these eight-legged creatures have long legs that keep their bodies out of reach of insecticides on various surfaces, nor do their circulatory systems carry insecticide to vital organs. So, while you might call in exterminators, your best bet in preventing spiders in the future is making your house less of a desirable place for them, and in fact, the surprising culprit, if you have a spider problem, could be your roof. Technically, you could say that the culprit is the tree branches overhanging your roof. 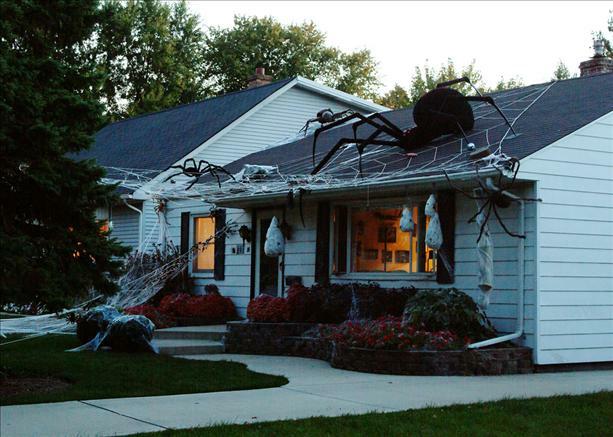 Spiders go up a tree, perhaps in pursuit of a meal, crawl onto branches, and end up on your roof. From there, they can find their way into your house through cracks around the eaves and other crannies. The same idea applies if you have, say, vines or trellises going up the side of your house. One of the top roofing tips for homeowners is to keep their trees pruned so that they don’t interfere with the roof. A big reason for this is because branches can scratch your roof and damage shingles. In addition, leaves, pine cones, twigs, and the like can pile up on your roof, rot, and cause decay. Now you have yet another reason to keep these trees neat and trimmed. Not only should that cut down on spiders, it should cut down on other pests in your house. In fact, the fewer insects you have hanging out around your house, the fewer reasons spiders have to check the area out. Bonus tip: If you have outdoor lights on at night, try to keep them off. After all, spiders love bugs that are attracted to lights. Other ways that spiders can get into your house are through cracks near the doorways and windows. Use caulk, fitted screens, and weather strips where necessary to seal gaps. Power washing your house can also get rid of cobwebs. Examine whether you have dusty or debris-filled storage areas such as crawl spaces or sheds; they can be primary residences for spiders. In fact, a box you brought into your home from an outside place, say, your school library, could be how a few spiders got inside. Perhaps your trees are trimmed back, and you’ve taken care of all possible entrances you can identify. Yet you still seem to have a spider problem. One solution is to try glue traps. They won’t necessarily resolve the problem—because it can just be luck if a spider happens to wander into one. However, if you strategically position the traps, you may notice patterns. For instance, if five spiders are stuck in glue traps along the right side of an attic wall but none are in the traps on the left side, you know that there’s a place connected to the right side where the spiders are getting in. Thus, you can double up on your screening or caulking efforts there. Spiders are rarely fun for homeowners to deal with, but they do provide valuable services in getting rid of bugs and other pests. Problem is, you want that to happen in your garden and not in your house. Getting your trees trimmed back so that they don’t overhang your roof is a good idea.